3.1 What version of Visual Studio should I use to create a DREAM plugin module? Question: What version of Visual Studio should I use to create a DREAM plugin module? Answer: Directly supported versions VS 2013 (update 3 or newer) and VS 2015 (update 2 or newer). DREAM Suite has been developed in Visual Studio 2013. Projects of all demo examples and source-code templates have therefore format of VS 2013. If you use Visual Studio 2015 (or a newer version), these projects can be easily converted to a newer format, which can be done automatically when opening the project in a newer version of Visual Studio. If you want to use a different version of Visual Studio than VS2013 or VS2015, it is possible but you will have to prepare several third-party libraries (Boost and Eigen) and copy them to DREAM SDK directory (usually C:\Users\Public\Documents\PC-Progress\DREAM Suite 1.x\SDK\Tools). Question: When compiling the plugin module of Example01, I get error message "Cannot open include file: 'DreamShared\DreamShared.h': No such file or directory". How to fix this issue? Answer: File DreamShared.h is located in DREAM SDK directory and path to this directory is defined by system environment variable DREAM1_SDK. Check the value of this variable and verify that the file really exists (i.e. that DREAM Suite has been installed correctly). 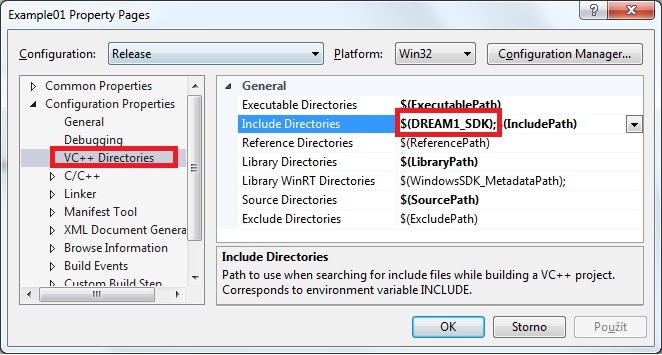 Also, verify that $(DREAM1_SDK) is present in "Include directories" of the project - see the attached figure.